The favorite game show all over the world makes a comeback on the Philippine Television. Now Who Wants to be a Millionaire is set to grace TV5's lineup of shows. Based on the original British format, contestants coming from all over the country will compete to get on the "hot seat" to which the ascent to the seven-digit jackpot begins by answering 15 multiple-choice questions correctly. Traditionally, Who Wants to be a Millionaire? is a general knowledge game show that sets off challenges, suspense, and a 1 Million cash prize. But as it lands on TV5, the show escalates it to a P2,000,000 jackpot prize, turning the contestants eager and excited as the questions eventually turn into higher levels of difficulty. 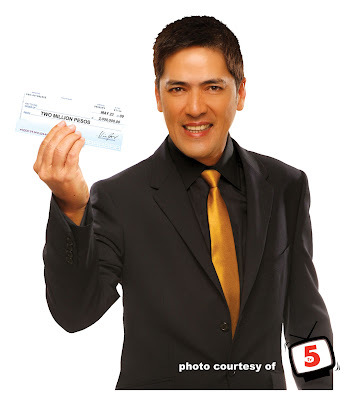 Aside from the game show's exciting format and crisp mechanics, Vic Sotto as Who Wants to be a Millionaire? game show master and as the latest addition to the TV5 family is already something that makes this return extra special. For the shows premiere, it will gonna be a star studded week that will include several celebrities such as Ara Mina, Polo Ravales, Assunta de Rossi, Rafael Rosel, Manilyn Reynes, Jay Manalo, Megan Young, Gladys Reyes, Nadia Montenego and Mo Twister on the hot seat. So this coming May 23, 6pm. Be sure tto be tuned on TV5 to witness the return of the most well loved game show on Earth only here in TV5 Shake it sa Tag-init. Interested contestants all over the country are given the chance to win millions by just simply typing in "MILLION (space) Name" to 2910 on their mobile phones, wherein an automated reply will be sent to the subscriber for the next steps. paano sumali dito, joriben? do you know how? thanks! tanong ko, gusto mo bang sumali? gusto ko ding sumali. base dun sa mga nabasa ko, iba na ang number at format. Paano na po ba? Thanks!